April 1 marked the beginning of Hermosa Beach’s ban on single-use plastic bags for retailers larger than 10,000 square feet. But Hermosa Cyclery could have waited. Smaller stores will have until Oct. 1 to comply. And at only 1,575 square feet, the beachside bike shop is well under the threshold. The rapidly developing environmental consensus on the issue, however, forced its owners to act a bit more quickly. 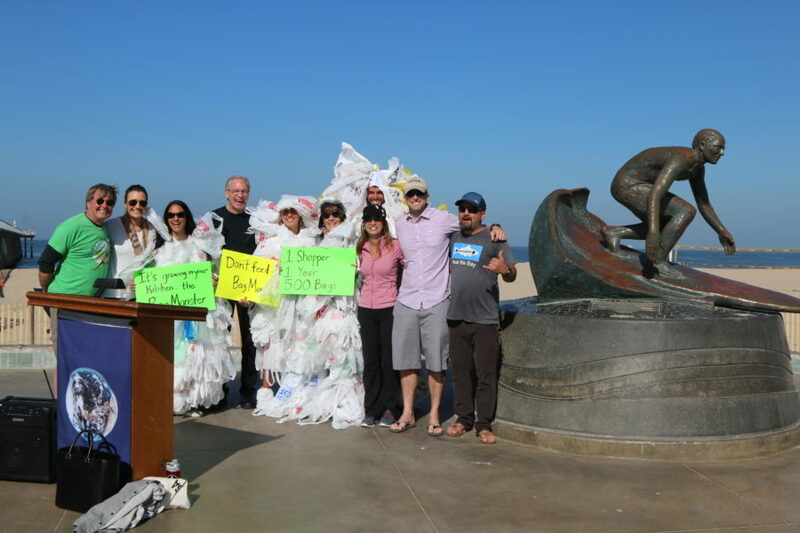 As Hermosa Beach celebrates Earth Month with a variety of eco-friendly initiatives, the plastic bag ban looms large in the city’s efforts to present itself as a leader in the municipal environmental movement. And Hermosa Cyclery is one of several businesses that got a jump start on the ban. Stores like Spyder and Gum Tree are among those pushing the city to further its commitment to environmental issues. On the first day of the Bag Ban, Gum Tree offered the first five customers a reusable “Truly Hermosa” canvas bag. 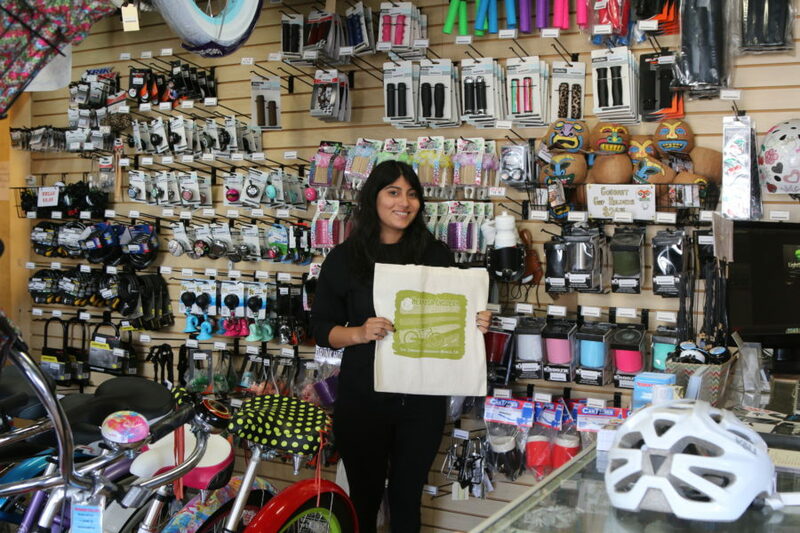 Collins said Hermosa Cyclery decided to eliminate plastic bags and offer reusable ones in July 2015. The store now sells the canvas bags to customers at cost or, after a large enough purchase, throws one in for free. While it may have been a risk to profit margins initially, Collins said betting on the environment has paid off. “It’s been well received, and we feel comfortable that we are supporting the sensibilities of the community by having eliminated single-use plastic bags on our own,” Collins said. It’s the kind of initiative that city officials say will be needed to keep Hermosa at the head of the pack of environmentally friendly cities. “Even though this is Earth month, the best results are when changes extend throughout the year, and become ingrained in our daily lives,” said Mayor Carolyn Petty. Gov. Jerry Brown signed a statewide ban on single-use plastic bags in 2014. But the American Progressive Bag Alliance, a plastics industry trade group, qualified an initiative for November 2016 ballot that would overturn it, arguing that such bans have “negligible” environmental benefits. Qualifying the initiative forced a stay of the ban, and Hermosa is one of only two cities in Southern California that have imposed a plastic bag ban since. Even if the statewide ban is reinstituted come November, local activists say the city can affect real change in the intervening time. Craig Cadwallader, head of the Surfrider Foundation’s South Bay chapter, said that the bag ban will eliminate close to 10 million plastic bags per year in Hermosa Beach. Their average “use time” is 12 minutes, but the bags will persist in the environment for decades. “It’s totally unacceptable that we would use something that would last so long and do so much harm,” Cadwallader said. Brian Cooley, co-owner of Wicked+ and Beach & Beverly on Pier Avenue, is among the retailers who got the message. Cooley was an early supporter of the city’s effort to ban plastic bags. Cooley said in an e-mail that since opening, his stores have not stocked plastic bags, and employees avoid the retail habit of automatically stuffing every purchase in a bag. The store stocks a sustainably manufactured reusable bag with a “Hermosa Beach” insignia.